Letter boxing is a fun activity for those who RV travel with kids, or even those who are just looking for a fun outing when not on the ultimate family vacation adventure. 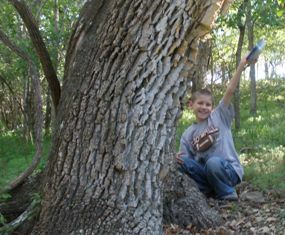 Similar to geocashing, letterboxing is a great way to see the outdoors and start a hobby that the whole family will enjoy. The hobby of letterboxing is a way to connect to others throughout the world by connecting to nature. Someone, a letterboxer, creates a special box filled with a rubber stamp, and a sketchbook, and hides it somewhere outdoors. This person then posts clues online as to the whereabouts of the box. Other letterboxers then follow the clues and find the letter box; stamping their own sketchbook with the rubber stamp at the site, and stamping the box's sketchbook with their personal rubber stamp. The finder then returns the letterbox to its original hiding place, where the next letterboxer can find it. There is some secrecy involved, which thrills the children. You aren't supposed to tell park rangers or passers-by about where to find the letterboxes, so they aren't permanently removed or destroyed. We did make the decision to include another family we met on a day of letter boxing; the mom was writing a newspaper article about fun things to do with children. Hopefully, other families will become interested by the piece and start their own letterboxing adventures! For those familiar with geocashing, letterboxing is similar. You get to go on a treasure hunt to a place you might not otherwise visit and you get to uncover a box. But instead of loot inside, you get that special memory of your trip with the rubber stamp you place into your book. Our kids are always looking back through our sketchbook and saying things like, "I remember! This was the one that Daddy fell into the water trying to find!" or "This graveyard was really scary 'cause it was cloudy that day." And that's the real joy of letter boxing: seeing something new, and creating family memories. This is part of what makes RV travel with kids the ultimate family vacation adventure. So are you ready to get started? Here are the supplies you will need to bring on your letter boxing adventure. First though, make sure you take some time and read more about letterboxing from the Letter Boxing North America website. You'll also find the clues to letterboxes in your area here as well. Next, acquire the following supplies. Most can be found at a craft store, though your personal stamp may take a little more thought and effort. You can purchase a rubber stamp at a craft store, create one yourself, or purchase a custom one online, which is what we've done. 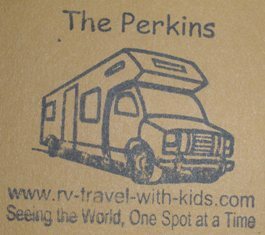 We had one designed with our website address on it and a picture of an RV. Find some symbol that is meaningful to your family and use that. 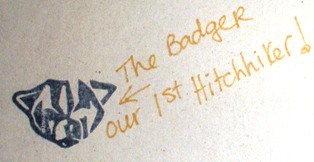 Our stamp is a little big, and if I were to do it over again I would go with something much smaller. I'd recommend around 1" square for the size of your stamp. Some letterboxing enthusiasts really go all out with their stamp pads! Many have colored ink pads, some with rainbow colors, metallic colors and even glitter. Get as fancy as you wish. You'll need a nice felt tip pen or skinny sharpie for marking things like the date in your book as well as the book at the site. You may also want to record in your sketchbook things like the name of the letterbox you've found, the park or town you found it in, and any other interesting tidbits about your adventure. Pick up a nice scrapbook quality sketch book at a craft store to use for the stamps you collect on your letter boxing journey. Spend a few extra bucks and go for the pretty one. This is the book that you will look back through years from now, and the one that you will show others as you introduce them to this fun hobby. Its good to have a supply of cleaning materials on you as you go on your adventures. Wrap your own stamp in a small strip of felt (you can buy this at WalMart for about a quarter) and consider placing one in the folds of your scrapbook to prevent bleeding on newly stamped pages. Paper towels or unscented baby wipes are a good idea for cleaning off stamps from found letterboxes after you have used them. It does get messy! I always keep a few nice Ziploc (not off brand sandwich baggies, actual Ziploc baggies) baggies in our letterboxing bag for instances where we find a box that is in desperate need of a little more protection. Since these boxes live outside, in all the elements of nature, sometimes the current bagging gets ripped and providing a little maintenance is a nice way to let others enjoy the box later. All set? Great! Now its time to find boxes hidden in your area! You get your clues from going to the Letterboxing North America website and printing off the ones that seem interesting to you. As you become more and more involved in this hobby, you will find all kinds of different ways that those interested in letterboxing will connect. Clubs, get togethers, online chatting and more. One thing we really like is the concept of a letterbox hitchhiker. This is a little mini letterbox that travels from one letterbox (and letterboxer) to another. If you find one, read the instructions, and if you are able to, bring it with you to your next letterbox find. Drop it off there for someone else to move it again. Since we travel too, it is especially fun to find these little friends! We found our first Hitchhiker in Texas, and the kids really want to create a few of our own. That'll be our next project. 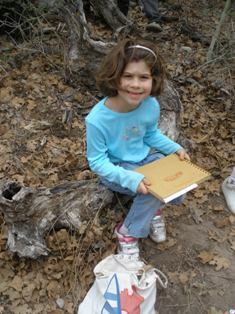 All together, letterboxing is a great family hobby just as much fun as geocashing. You get to see the great outdoors, and share a grand secret with others all while making your mark on the world. Try it!